Established For Over 55 Years. Best Prices & Top Quality. Car Door / Wing Mirrors. Thule Bike / Cycle Child Seats. Thule Pack n Pedal Accessories. Towbar Quick Finder A to L. Towbar Quick Finder M to V.
What is included in this listing? We also offer a wide selection of vehicle specific wiring kits. Deliveries are made Monday to Friday (excluding Bank Holidays). IV7, IV9-12, IV14-28, IV30-32, IV36, IV40-56. Stock levels are not updated in real time. If there is a stock issue with your order you will be contacted as soon as possible. Every effort is made to ensure accuracy in the information provided, however no liability is accepted in case of error or missing information. You may find that your vehicle lies on a year change. For example: a 2005 registered vehicle when the tow bars run 1998 to 2005 and 2005 onwards. The vehicle registration is not an accurate indication of which version you have. You need to know your exact model. Motor Homes / Campers / and LPG Conversions. We cannot guarantee tow bar compatibility for motor homes / camper / LPG conversions. We can advise a bar suitable for the base vehicle, but you would need to check the fitting instructions and judge for yourself if it would be suitable. We cannot guarantee tow bar compatibility for imported vehicles, unless the tow bar is specifically flagged as being for an import. EC approval is required on all tow bars for passenger vehicles from 1998 onwards. You will find the EC approval number on the tow bar itself. In the UK this meets current requirements. In other countries you may also require a certificate for the vehicle paperwork. We do not supply these as standard, but they are available on request. There may be a charge for the certificate. It can be necessary to cut your rear bumper when fitting a tow bar. There are 2 types of cut. Visible - A cut you can see when stood at the rear of the vehicle. Non Visible - A cut to the underside, where you cannot see it from the rear of the vehicle. Please note the cuts stated are for standard models with standard trim only. Some models require holes drilling in the chassis to attach a tow bar. There may be dimples as a guide, or on others you use the tow bars as a stencil, some require careful measurements. It can be hard to find pre-drilled holes in the chassis when they are present, quite often they are covered with tape and become indistinguishable when covered in road dirt. Tow bar manufacturers test their tow bars on standard models with basic trim levels. If your vehicle has special trim, such as S-Line, X-Pack, M-Sport, or similar, please double check the item is listed as compatible with your trim. Tow bars can cause issues with parking sensors. Depending on the vehicle, the positioning of the sensors and the type of tow bar being fitted it is possible the towbar will be picked up by the sensors. On fixed type tow bars there is no way to tell if there will be a problem until the bar is fitted. Detachable types avoid this issue as they can be removed when not is use. Universal Electrics - A basic form of electrics suitable for all vehicles. Generally fitted by splicing into the vehicle wiring and connecting with scotchlocks or soldering them in. Some vehicles may also require a bypass relay to be fitted for them to work properly. The advantage with universal electrics is the low cost. Vehicle Specific Electrics - Also known as dedicated electrics kits, each kit is suitable for a specific model. Twin 7 Pin / 12N & 12S / Double Electrics - One Black & One Grey Socket of 7 Pins Each - Twin towing sockets have the function of a single 7 pin along with a second socket to provide a charging line for a leisure battery. Charge for this is taken from the towing vehicle charging system via an automatic split charging relay so that both leisure battery and vehicle battery have sufficient power. The 12S socket also contains a power feed for the reversing lights on the caravan. This type of electrics is generally found on older caravans. 13 Pin - One Black Socket of 13 Pins - 13 pin towing sockets are the newest style of towing socket and combine the functions of twin electrics into a single socket. As of September 2008 all caravans manufactured will be wired up with 13 pin plugs that meet ISO11446 (International Standards Organisation) and the U. 13 pin is also the most common type of electrics used on the continent. Many modern vehicles cut down on weight, size and volume of the wiring looms by using electronic control systems to operate the vehicle's lights. You may hear these systems referred to as "multiplexed" or "CAN-Bus" systems. This causes the fitter a problem in that the trailer or caravan lighting is traditional filament lighting with one wire per function and is not designed with these "multiplexed" systems in mind. What is needed is a way of "translating" the vehicle's pulsed shared signals into constant 12 volt supplies to each light on the trailer or caravan. The 7-way smart bypass relay does the job of translating these signals and is a simple in-line fit between the towbar wiring and the vehicle loom. The fitter need not have an in depth understanding of the "multiplexed" system - the smart bypass relay's inbuilt microchip does all that. Maximum Towing Capacity - Measured in kilograms. Maximum Nose Weight - Measured in kilograms. Also know as static vertical load or tongue weight. The part of the weight of the trailer / caravan which is supported by the rear of the towing vehicle and tow bar. This is also the maximum weight to consider for tow ball mounted bike / motor cycle carriers. Vehicle Not Homologated For Towing. Not all vehicles can tow, for a variety of reasons. In general you can check by looking in your handbook or checking the VIN plate for a specified towing capacity. Examples of vehicles that cannot tow are: BMW M3 models, Smart ForTwo, Ford Mondeo ST220. Alko compatible tow balls have extended necks compared to standard tow balls to give extra clearance for stabilisers. Swan neck and detachable type tow bars are alko compatible as standard. For flange type tow bars, an alko compatible tow ball can be fitted. Alko type balls fit the same way as standard tow balls and can be used with a non-alko trailers also. Alko tow balls should have the paint removed from the ball and be kept free of grease. PF Jones - Quality, Service, Value. The core values of PF Jones are clear and simple; Quality, Service, Value. What Our Customers are Saying About Us! The item "Towbar for Nissan Primera Hatchback / Hatch (P11) 1999-2002 Flange Tow Bar" is in sale since Monday, October 3, 2011. 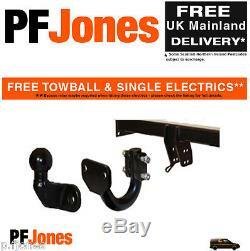 This item is in the category "Vehicle Parts & Accessories\Car Accessories\Trailers & Towing\Tow Bars".fjones" and is located in Manchester. This item can be shipped worldwide.